Treehugger showed us the simplicity of Topiade by Gas Design Group. 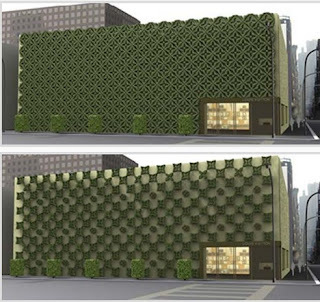 This overlay facade for existing Louis Vuitton stores that melds topiary forms in, you guessed it, shapes reminiscent of the LV logo... store branding to the extreme. From the renderings, it seems partially artificial and partially vegetated... Interestingly, Gas Design Group is a industrial and product design firm - illuminating for me, that like green roof technology, living wall technology will inevitably be pressured to perform not as a landscape, but as a commodity. 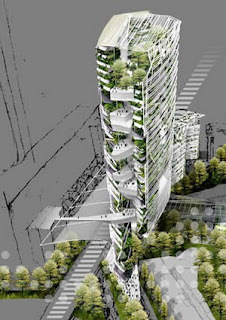 On a totally different scale and concept, vegetative-leaning architect Ken Yeang's rendering for a 'bioclimatic' Elephant and Castle skyscraper in London. 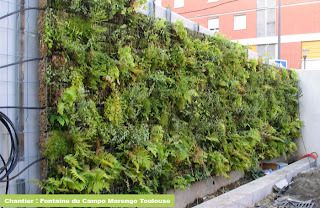 Our third is another 'component' from a French company called Vegetalis, Greenwall S.A.S. The initial web shots shows some of the structural components for their mur vegetal, which, if my high school french doesn't fail me, means vegetated wall. Makes sense. Part of the appeal of these walls is the modularity, which has created products by a number of manufacturers, which can be installed, removed, adjusted in theoretically a simple manner... My upcoming goal is to collect examples of each of the systems to compare how they work, as well as visit some sites... now I just need to find a way to Paris.